Cat. No. 3026 Scene Light Robopak® Kit comes complete with our M1 Scene light, Quad Pod stand, XL9208 Robopak® , 12V adapter, AC charger. The Green Hornet LED Scene Light is powerful, portable, rugged and versatile systems designed for Fire & Rescue, Military, Utility, Construction and other applications. Years of market research and design has produced a proprietary blend of requested key features not available from existing portable LED and other conventional lighting systems. The M1 comes with an attached Telescoping Quad-Pod Stand (see below). The M1 Scene Light provides two round 7" Military grade lights with high output LEDs that can be operated independently, producing a powerful high (both lights) or low (single light) feature. Each light can rotate 360º clockwise or counterclockwise and 180º horizontally, allowing users to cover needed areas unavailable by other lighting systems that only provide "front" type projections. These lights produce a unique proprietary retangular spot pattern with a flood outlay covering an extremely large area. The Green Hornet series also features an independent amber center warning LED light that has 11 separate flash patterns that can be seen for miles. 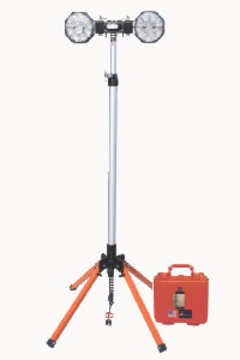 TELESCOPING QUAD-POD SYSTEM: Traditional telescoping systems use a tripod (3 legged). However, research indicates that these systems have been proven to be unstable in many circumstances especially when encountering uneven terrain. Further, most telescoping systems are hard to raise and do not provide enough height to avoid a blinding effect that can be created by LED lights. The Green Hornet lights address these problems. The M1 Green Hornet can reach a height of 10.5’ and it uses a quad-pod safety stand that has easy to use independent telescopic legs that also provide three easy to adjust heights (pull pin or kick release levers). Each leg is heavy-duty powder coated metal with non-skid rubber feet. Setup only takes seconds!